Hundreds of expectant women from Mexico come to Arizona every year specifically to deliver babies at hospitals near the border. Expectant women from Mexico crossing into the U.S. to give birth has occurred along the border for years, but there is little proof the practice is widespread. Some are in the country illegally. But many others are women of means who enter the country legally as tourists and pay cash to deliver babies at hospitals in Nogales, Yuma and Tucson. In addition to medical care that is perceived to be better in the U.S., the mothers receive an added benefit: Their babies automatically become U.S. citizens. The practice, dubbed "birth tourism" by critics, has been occurring along the border for years. It also happens in cities around the country where expectant women from overseas arrive by plane with tourist visas, with the goal of giving birth during their stay. Some Republican lawmakers want to put an end to the practice of granting automatic citizenship to children born in the U.S., a right laid out in the 14th Amendment. They call such acts — whether children are born to illegal residents or legal visitors — an exploitation of the Constitution. While birth tourism is real, there is little proof the practice is widespread, even in border states such as Arizona, where last year less than 2 percent of babies were born to non-resident mothers. 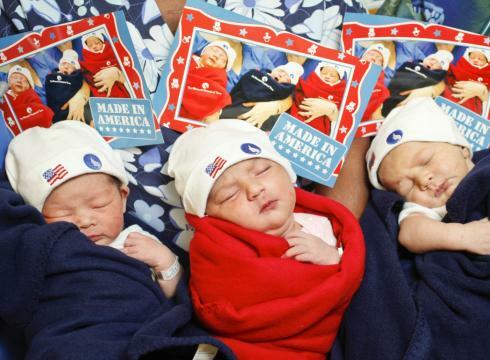 In 2008, slightly more than 7,400 children were born in the U.S. to non-citizens who said they lived outside the country, according to the National Center for Health Statistics. The figure was the most recent available. The number includes children born to women studying at U.S. universities, international visitors as well as so-called birth tourists. It does not include a much larger number of children born to undocumented parents residing in the U.S., which supporters of limiting birthright citizenship also point to as a problem. The Pew Hispanic Center estimates that 350,000 children with at least one undocumented parent residing in the U.S. were born in the U.S. in 2009. That is about 8 percent of all births that year. By comparison, birth tourism is a much smaller issue. Although up nearly 50 percent since 2000, the 7,462 children are still just a tiny fraction of the 4,255,156 babies born in the U.S. that year. "I feel a little like they are chasing the Loch Ness monster," said Angela Maria Kelley, vice president for immigration policy and advocacy at the Center for American Progress, a liberal-leaning research group in Washington, D.C.
Arizona does not keep statistics on births to non-U.S. residents, but in 2010, 1,534 children were born to mothers who did not live in Arizona. That is less than 2 percent of the 88,100 total births at all hospitals in Arizona. The number includes children born to women who were residents of other states, such as California and New Mexico, as well as children born to mothers who are from Mexico or other countries. Most of the births to non-state residents occur at hospitals close to the border, which some suggest is evidence of birth tourists. And nearly half of all the non-resident births occurred at three hospitals: Yuma Regional Medical Center, with 283; Carondelet Holy Cross Hospital in Nogales, with 277; and the Tucson Medical Center, with 188. All three hospitals offer prepaid delivery programs that allow pregnant women to schedule labor and delivery services ahead of time and pay for the services up front. Many hospitals, not just those along the border, offer prepaid programs. Officials at all three hospitals said the programs were intended for women who do not have insurance. The programs are not targeted specifically at women in Mexico, they say. And none of the hospitals advertises the programs south of the border. "We are not doing anything to profit or promote it," said Michael Letson, the spokesman at Tucson Medical Center. "It's not an element of our business plan at all." In Nogales, Sonora, a city of 220,000 people, residents have several options for delivering babies. In addition to a regional hospital run by the state government, there are at least three state-funded clinics where women can give birth, said Alejandro Palacios, director of communications for the city. The delivery services at state-run hospitals and clinics are free for women who qualify for government-funded health care. In addition, there are at least six private hospitals in Nogales, where patients pay in cash for medical care, he said. In San Luis Rio Colorado, across the border near Yuma, there are eight public hospitals or clinics and six private hospitals where women can give birth, according to a city official. In January, U.S. Rep. Steve King, R-Iowa, introduced a bill that would limit automatic birthright citizenship only to children with at least one parent who is a U.S. citizen or legal permanent resident. "Passage of this bill will ensure that immigration-law breakers are not rewarded, will close the door to future waves of extended family chain migration, and will help bring an end to the global 'birth tourism' industry," King said during a news conference to introduce his bill. The bill, which has 78 Republican co-sponsors, is part of a strategy to force the U.S. Supreme Court to revisit the 14th Amendment. The 14th Amendment contains a citizenship clause that says that "all persons born or naturalized in the United States, and subject to the jurisdiction thereof, are citizens of the United States and of the State wherein they reside." Backers of the bill, however, believe the phrase has been misinterpreted. They want the Supreme Court to declare that birthright citizenship shouldn't apply to children born to undocumented parents, foreign visitors or "birth tourists." Noel Clay, a spokesman for the U.S. State Department, which grants visas, said women applying for visas are not asked pregnancy questions during the interview process. A Department of Homeland Security statement e-mailed to The Arizona Republic said pregnant women were not prohibited from entering the U.S. But coming to the U.S. for the purpose of child birth is not a valid reason for travel. Entry is allowed or denied at the discretion of the admitting Customs and Border Protection officers. "When determining if an individual will be allowed to enter the U.S., CBP Officers take into consideration the date the child is due for delivery and the length of time the individual intends to stay in the U.S.," the statement said. Officers can deny entry if they determine the U.S. could end up paying for medical care because the individual can't afford it or doesn't have sufficient medical coverage, the statement said. Kelley said some critics try to present birth tourism as a significant issue, perhaps even more significant than children born to illegal residents. She said trying to end birth tourism through federal legislation is overkill. "Instead of using a fly swatter, they are using an Uzi," she said. We need to amend the Constitution already. Children should not automatically become citizens just because they were born here. I disagree, but there need to be stipulations. You don't get automatic citizenship if one or both parents are in the US illegally or on a temporary/tourist visa shorter than x number of days. Yeah, because not granting citizenship to children born of illegals isn't setting up a time bomb for the next generation or anything. 8% of children are born to at least one illegal parent? Something like that? Now how about in 20 years when 8% of the population (because you can't deport them: there's nowhere to deport them TO) is a permanent non-citizen underclass, and they continue to breed faster than the rest of the population. Assimilate them, don't drive them farther outside the American core. That's my point, they should be born to at least one US citizen, or at least someone on track to becoming a US citizen, to be considered a citizen themselves. They aren't assimilating with us. They refuse to learn our language, they commit crimes, they reproduce much beyond their means, etc etc. We cannot afford to handle the burdens already in our country. I'm for work visas, where employers are allowed to bus eligible foreigners in seasonally, and bus them out at the end of the season. Return employment is dependent on following our laws and leaving after every season. After five or so years of that along with other stipulations, such as passing an English test, we grant them and their families a pending citizenship status which can be revoked for a certain amount of time afterwards if any of them break laws or cease to accept employment if available. Jumping a fence and popping out a child four miles this side of the border should not grant access to this country.